Two actors perform during "Stagger Lee" rehearsal. Will Power’s new musical, Stagger Lee, was inspired by the folk figure of Stagger Lee but it includes others from African-American history and myth — notably, the unfaithful, violent lovers, Frankie and Johnny. Much like “Stagger Lee,” “Frankie and Johnny” is an American musical standard composed by — no one knows who, definitively. There are several claimants, but it’s hard to sort out authorship, partly because so many versions popped up around the same time about a hundred years ago. But some music historians even believe the song about the woman who shot her man after “he done her wrong” predates the Civil War. The most popularly accepted origin is that, just like “Stagger Lee,” the song was inspired by an actual killing, probably the 1899 shooting of Allen (or Albert) Britt by his 22-year-old girlfriend Frankie Baker (who was possibly his prostitute). In the song, Frankie sees Johnny flirting with or sleeping with Nellie Bly (or Bligh). In real-life, Baker evaded a murder conviction by claiming she’d been attacked by Nellie. With a sprightly ragtime charm, Frank Crumfit recorded an early version of “Frankie and Johnny” in 1927. Louis Armstrong (1901-1971) was born just two years following the shooting in St. Louis that may have inspired “Frankie and Johnny.” In this 1964 recording, he delivers a mellower, more consciously retro, honkytonk version. Sam Cooke (1931-1964) gives the old story a rich, brassy, powerful, rhythm-and-blues gloss in this live version. Consider: This recording, from Cooke’s great At the Copa album, was released the same year as the Louis Armstrong cover above. Johnny Cash (1932-2003) performed “Frankie and Johnny” in the 1963 film, Hootenanny Hoot, with a rockabilly-ish rhythm, a certain tongue-in-cheek humor and that great bass reverb in his voice. Born in Glasgow, Scotland, Lonnie Donegan (1931-2002) recorded this version for his album, Talking Guitar Blues in 1965. Donegan’s nasal, Scottish, heartbreak vocals and his propulsive, skiffle sound influenced a generation of British musicians — most notably the Beatles, who began as a skiffle band modeled on Donegan’s. Elvis Presley (1935-1977) took the story of “Frankie and Johnny” to the big screen in 1966 (earlier film versions include one with Mae West). Neither the song nor the film is exactly an impressive effort from the King: Playing a riverboat gambler, Presley performs alongside Donna Douglas (the late “Elly May Clampett” from The Beverly Hillbillies) as Frankie and Nancy Kovack as the temptress, Nellie Bly. Join KERA’s Art&Seek for a rare backstage look at how a professional musical is born. The Dallas Theater Center built Stagger Lee entirely from scratch, from the story to the set. Art&Seek has tracked the progress of the show since an early workshop in 2013. 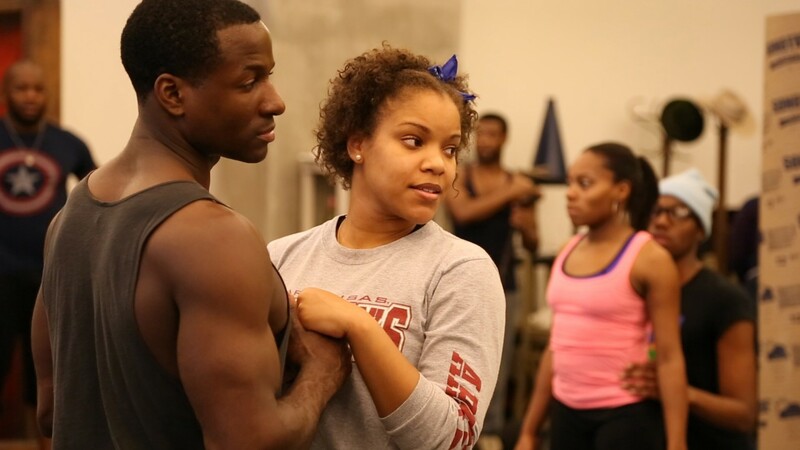 The show opens at the Wyly Theater on Jan. 30. Meet the creators of the story and music, watch the show change, learn more about the real-life Stagger Lee, and listen to the way musicians have mythologized him for almost a century.